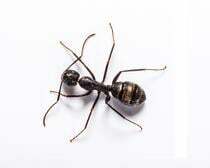 Most of the ants you will encounter in New Jersey and Pennsylvania are wingless. However, you may encounter a swarm of flying ants at different times of the year. The most important thing to know about flying ant activity is that it will not last forever. Swarms burst for a short amount of time and then cease entirely. Unfortunately, there is nothing you can do to reduce the amount of flying ants or stop them from emerging once they begin appearing. Several companies claim that they can stop flying ant swarms, which is not possible. Flying ant treatments will not work and they are simply a waste of your time and money. If you see think you are seeing termite swarmers, please give us a call at 1-800-949-2667 or fill out the contact form. Learn more about identifying termites and flying ants by reading our blog post here.